Tire or Ball inflator, Pet Convincer Refill, HVAC - will not degrade innertubes!;Mr. Fizz (tm) refill, Beer keg propellant - food grade; 5+ year shelf life! 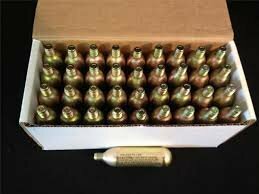 ;16g CO2 THREADED cartridges;Most orders ship from FL the SAME business day!!! ;weld-sealded cadmium coated steel - no oils! If you have any questions about this product by 16g CO2 Threaded, contact us by completing and submitting the form below. If you are looking for a specif part number, please include it with your message.